I’m shopping for a Toastmaster’s group right now. This isn’t because I’m scared of public speaking and I’m not particularly bad at it. I simply want to keep my skills sharp with more regular practice. I visited my first group two weeks ago and was shocked to discover the secret power of Toastmasters. It’s the clapping. Every single person is applauded for every single thing they say. I know this might sound sappy but, actually, it’s invigorating. The second group I visited had finessed even this action. New members giving their very first speech (which is called an ice-breaker) get a standing ovation. Again, I feared this would be ridiculous but I changed my mind when I saw 25 people leap to their feet and start applauding. The look of relief on the face of each speaker was transformative and it was obvious how much this action supported even the really rambly, inarticulate speakers. In fact, it was probably more important for them than the good ones. This made me reflect on the use of positive reinforcement. 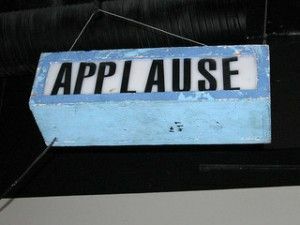 Whenever you’re learning to do something new — whether it’s public speaking, cooking or writing — it’s valuable to get applause (literal or metaphorical) for what you do. Even if you do it badly, the positive comments are far more likely to help you improve than the negative ones. I think I experience the same sort of thing myself whenever I’m talking to one particular client. He is outrageously enthusiastic about me and my work. Although we have the occasional argument, I mostly receive bucketsful of praise from him. And guess what I’ve noticed? I work harder for him. I’m also funnier and smarter around him. Perhaps it’s because this is what he expects of me. Or, maybe it’s because I’m more relaxed and less stressed. But I try to reach his very high expectations. In other words, praise works. Which brings up the thorny question of writing groups. Over the years of producing this column, I’ve received frequent emails from readers who’ve been stressed by their writing groups. The group is too negative, they tell me. There are personality problems with various members. One bossy boots seems to hog the floor the whole evening. The list of problems goes on and on. So, leave the group, I usually advise these people. Most are shocked when I suggest this. “Isn’t a group like this essential for my growth as a writer?” they wonder. Actually, no, I tell them. In fact, I think there’s a big problem with the concept of many writing groups. Most groups are formed by friends or acquaintances who aspire to write. Occasionally the group may come together from strangers joined by a community centre or a university. They may include executives, electricians, housewives and students. Nothing wrong with that. But here’s my question: how do you know that the criticism made by the person sitting next to you, carries any value? Furthermore, I’ve found that such groups tend to attract people who love to criticize rather than praise. And that can be toxic. Editing is not a group exercise and it requires significant training. If you want to join a writing group, I suggest you stick to one that engages in NO critiquing and acts, instead, as a networking group — introducing you to other writers — or an accountability register. For example, each member might commit to writing 500 words per day. At the meetings, each member should report on the word-count he or she achieved over the week or month. I think reading from finished work is fine but, again, it should not be for critiques. And applause should be required. As Toastmasters demonstrates, praise isn’t always deserved. But it works.